The Mi Max 2 has just been announced by Xiaomi India. The successor to the big screen phone from last year, retains the 6.44" display size, and the 1080p Full HD resolution. The Mi Max 2 sports a full metal body, with rounded edges for an ergonomically pleasant experience. The screen on the new device is a 2.5D Curved Glass panel and is protected by a Corning Gorilla Glass 3. There is a new feature called Split Screen, available in the Global MIUI Beta for the Mi Max 2, which allows you to run 2 apps on the screen at the same time. The phone runs on MIUI 8 based on Android Nougat 7.1.1. The phone is powered by a 14nm FinFET Qualcomm Snapdragon 625 processor,has 4GB of RAM, and 64GB of internal storage. There is a microSD card slot which is part of the hybrid SIM card tray, which you can use for expandable memory. The Mi Max 2 has a the same camera as the flagship product from the company, the Mi 6. The main camera on the Mi Max 2 is a 12 megapixels lens, which has a Sony IMX386 sensor, and a 5 megapixels front camera which has an 85 degree wide angle lens for selfies. The Mi Max 2 packs in a 5300mAh battery, which supports Qualcomm Quick Charge 3.0.battery, which charges the phone up to 68% in an hour. The phone has a fingerprint scanner on the back, and an IR blaster on the top, and front facing stereo speakers. The Mi Max 2 will be available in a Matte Black variant, which has a fingerprint resistant coating. All Xiaomi Mi Max 2 Phones are manufactured in India as part of the Make In India campaign. 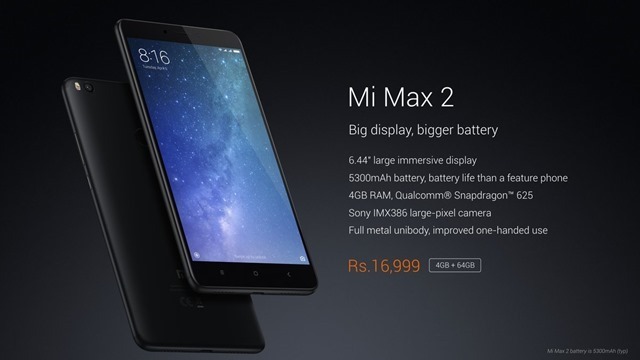 The Xiaomi Mi Max 2 has been priced at Rs. 16,999 in India and will go on sale on July 20th and 21st on Mi.Com and Mi Home stores, as part of Xiaomi India’s 3rd anniversary sales. The Mi Max 2 will be available from July 27th from Flipkart, Amazon India, Tata CliQ. Paytm online stores, and also in brick and mortar stores such as Poorvika, BigC, Sangeetha, Croma, Vijay Sales, eZone, and LOT. Xiaomi Mi Max 2 launched in India. Pricing, availability, and full tech specs inside.